Into Hair: Facial Hair Services - Threading. Unwanted hair for women is normal, maybe due to age, colouring or even heredity, but it is still very unwelcome. Unwanted hair appears all over the face for women, upper lip (moustache) being the obvious, misshapen eyebrows, the chin, forehead and the sides of the face (cheeks). These are all areas that women find embarrassing to have unwanted hair showing. Once unwanted hair was dealt with by shaving, which is not very feminine, and then the hair could return thicker. Cosmetic companies then made available a multitude of creams to remove unwanted hair. Other options that are available to women can be the obvious and painful waxing or even electrolysis, whereas the bleaching option to disguise the unwanted hair just means the woman ends up having just a lighter coloured moustache. For women today there is another and more pleasant option to rid unwanted facial hair. It's called Threading! This treatment can tackle the unwanted hair of the upper lip, eyebrows, chin and sides of the face (cheek). The Threading procedure consists of a very thin (cotton or polyester) thread that is doubled, then twisted. It is then rolled over areas of unwanted hair, plucking the hair at the follicle level. Unlike using tweezers where the single hair is painstakingly and labouriously pulled out one at a time, the threading method can remove short lines of hair. There are a few different techniques for threading. These include the hand method, mouth method and neck. Each technique has advantages and disadvantages; however, the mouth holding method is the fastest and most precise. The face is a very delicate area and as several hairs are removed at once, Threading can be painful if not done properly. However a good professional beautician can decrease the chances of any discomfort from Threading for most women. The process removes the fine and fuzzy hair right from the root. If it sounds painful, consider the options. Threading is said to be like waxing in getting the desired look, except Threading is more gentle and a more all round desirable option for women. Threading does not allow the hair to grow back darker or thicker. That only happens with shaving. If a woman uses the shaving option on her lip, the unwanted hair will come back stubbly, and eventually as strong as a man's. The use of a cream means the woman would be subjecting themselves to a possible chemical reaction, and also the cream option does not fully rid the hair at the root, so that means it is more likely just to grow back faster and thicker. The majority women that have experienced Threading say it is the best method of unwanted hair removal from the upper lip. One other benefit is that you don't have to wait for the hair to grow a certain length, so the woman can maintain the upkeep of the desired look. Some of the benefits that a woman can gain from a threading hair removal: No chemicals are used that will be applied on your skin, which could cause irritations or may contradict with medications that a woman may be taking. Even if some women are suffering from certain medical conditions that will conflict with sugaring or waxing, you can still have Threading done. It is also a very quick and sanitary procedure. This is because there is nothing else that will touch your skin but the cotton thread and this is always thrown away after using it on a client. The same cotton thread is never used on another client. 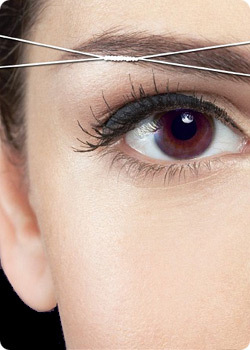 The temporary results from threading could also become permanent. This is because frequent threading can cause damage to the hair follicle over time, so preventing hair growth, unlike shaving and waxing that allows the hair to grow faster and thicker. Prices (a Threading consultation is free of charge). Full Face: £25.00 (including eyebrows. Does not include the neck). Middle of Eyebrows: £5.00 (female and male). Eyebrow Shaping: £10.00 (female and male).